More than two-thirds of reported investment policy measures in 2010 were in the area of FDI liberalization and promotion. This was the case for Asia in particular, where a relatively high number of measures eased entry and establishment conditions for foreign investment. Most promotion and facilitation measures were adopted by governments in Africa and Asia. These measures included the streamlining of admission procedures and the opening of new, or the expansion of existing, special economic zones. 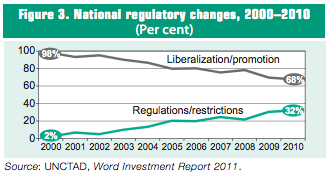 On the other hand, almost one-third of all new measures in 2010 fell into the category of investment-related regulation and restrictions, continuing its upward trend since 2003 (figure 3). The recent restrictive measures were mainly in a few industries, in particular natural resource-based industries and financial services. The accumulation of restrictive measures over the past years and their continued upward trend, as well as stricter review procedures for FDI entry, has increased the risk of investment protectionism. Although numerous countries continue to implement emergency measures or hold considerable assets following bail-out operations, the unwinding of support schemes and liabilities resulting from emergency measures has started. The process advances relatively slowly. As of April 2011, governments are estimated to hold legacy assets and liabilities in financial and non-financial firms valued at over $2 trillion. By far the largest share relates to several hundred firms in the financial sector. All this indicates a potential wave of privatizations in the years to come. 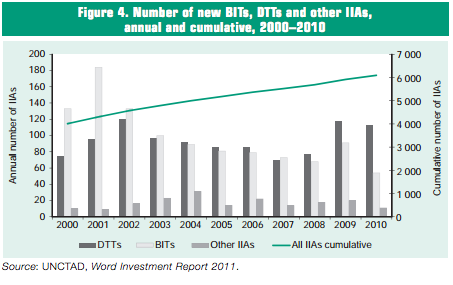 With a total of 178 new IIAs in 2010 – more than three new treaties per week – the IIA universe reached 6,092 agreements at the end of the year (figure 4). This trend of treaty expansion is expected to continue in 2011, the first five months of which saw 48 new IIAs, with more than 100 IIAs currently under negotiation. How the FDI-related competence shift from EU member States to the European level will affect the overall IIA regime is still unclear (EU member States currently have more than 1,300 BITs with non-EU countries). At least 25 new treaty-based investor–State dispute settlement cases were initiated in 2010 and 47 decisions rendered, bringing the total of known cases to 390, and those closed to 197. The overwhelming majority of these cases were initiated by investors from developed countries, with developing countries most often on the receiving end. The 2010 awards further tilted the overall balance in favour of the State, with 78 cases won against 59 lost. As countries continue concluding IIAs, sometimes with novel provisions aimed at rebalancing the rights and obligations between States and firms, and ensuring coherence between IIAs and other public policies, the policy discourse about the future orientation of the IIA regime and how to make IIAs better contribute to sustainable development is intensifying. Nationally, this manifests itself in a growing dialogue among a broad set of investment stakeholders, including civil society, business and parliamentarians. Internationally, inter-governmental debates in UNCTAD’s 2010 World Investment Forum, UNCTAD’s Investment Commission and the joint OECD-UNCTAD investment meetings serve as examples. With thousands of treaties, many ongoing negotiations and multiple disputesettlement mechanisms, today’s IIA regime has come close to a point where it is too big and complex to handle for governments and investors alike. Yet it offers protection to only two-thirds of global FDI stock and covers only one-fifth of possible bilateral investment relationships. To provide full coverage a further 14,100 bilateral treaties would be required. This raises questions not only about the efforts needed to complete the global IIA network, but also about the impact of the IIA regime and its effectiveness for promoting and protecting investment, and about how to ensure that IIAs deliver on their development potential. FDI policies increasingly interact with industrial policies, nationally and internationally. At the national level, this interface manifests itself in specific national investment guidelines; the targeting of types of investment or specific categories of foreign investors for industrial development purposes; investment incentives related to certain industries, activities or regions; and investment facilitation in line with industrial development strategies. Countries also use selective FDI restrictions for industrial policy purposes connected to the protection of infant industries, national champions, strategic enterprises or ailing domestic industries in times of crisis. At the international level, industrial policies are supported by FDI promotion through IIAs, in particular when the respective IIA has sector-specific elements. At the same time, IIA provisions can limit regulatory space for industrial policies. To avoid undue policy constraints, a number of flexibility mechanism have been developed in IIAs, such as exclusions and reservations for certain industries, general exceptions or national security exceptions. According to UNCTAD case studies of reservations in IIAs, countries are more inclined to preserve policy space for the services sector, compared to the primary and manufacturing sectors. Within the services sector, most reservations exist in transportation, finance and communication. The overall challenge is to manage the interaction between FDI policies and industrial policies, so as to make the two policies work for development. There is a need to strike a balance between building stronger domestic productive capacity on the one hand and preventing investment and trade protectionism on the other. Better international coordination can contribute to avoiding “beggar thy neighbour” policies and creating synergies for global cooperation. Over the past years, corporate social responsibility (CSR) standards have emerged as a unique dimension of “soft law”. These CSR standards typically focus on the operations of TNCs and, as such, are increasingly significant for international investment as efforts to rebalance the rights and obligations of the State and the investor intensify. TNCs in turn, through their foreign investments and global value chains, can influence the social and environmental practices of business worldwide. The current landscape of CSR standards is multilayered, multifaceted, and interconnected. The standards of the United Nations, the ILO and the OECD serve to define and provide guidance on fundamental CSR. In addition there are dozens of international multi-stakeholder initiatives (MSIs), hundreds of industry association initiatives and thousands of individual company codes providing standards for the social and environmental practices of firms at home and abroad. CSR standards pose a number of systemic challenges. A fundamental challenge affecting most CSR standards is ensuring that companies actually comply with their content. Moreover, there are gaps, overlaps and inconsistencies between standards in terms of global reach, subjects covered, industry focus and uptake among companies. Voluntary CSR standards can complement government regulatory efforts, but they can also undermine, substitute or distract from these. Finally, corporate reporting on performance relative to CSR standards continues to lack standardization and comparability. Governments can play an important role in creating a coherent policy and institutional framework to address the challenges and opportunities presented by the universe of CSR standards. Policy options for promoting CSR standards include supporting the development of new CSR standards; applying CSR standards to government procurement; building capacity in developing countries to adopt CSR standards; promoting the uptake of CSR reporting and responsible investment; adopting CSR standards as part of regulatory initiatives; strengthening the compliance promotion mechanisms of existing international standards; and factoring CSR standards into IIAs. The various approaches already underway increasingly mix regulatory and voluntary instruments to promote responsible business practices. While CSR standards generally aim to promote sustainable development goals, in the context of international production care needs to be taken to avoid them becoming barriers to trade and investment. The objective of promoting investment can be rhymed with CSR standards. Discussions on responsible investment are ongoing in the international community. For example, in 2010, G-20 leaders encouraged countries and companies to uphold the Principles for Responsible Agricultural Investment (PRAI) that were developed by UNCTAD, the World Bank, IFAD and FAO, requesting these organizations to develop options for promoting responsible investment in agriculture.